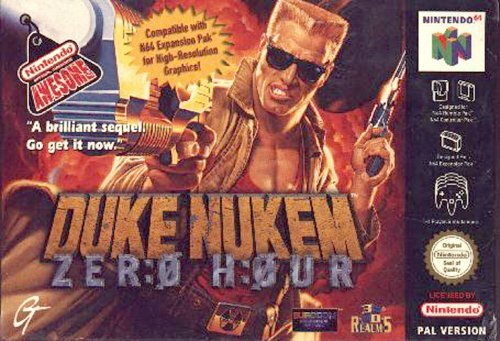 Thread: Duke Nukem: Zero Hour - Music by Lee Jackson - anyone? Duke Nukem: Zero Hour - 3D Realms - Music by Lee Jackson - anyone? If anyone has the score to this N64 game, I'd be grateful. I used to have a 12 track version at around 90kbps ... used to. Its time for a serious upgrade, if its out there, or just the 90kbps version again, if thats all there is. Good score to a difficult game made more frustrating by the absence of any save game points mid level. The 3rd level (or was it the 2nd? ), the one on and under Liberty Island, was the worst as far as trying to memorize the level over enough plays/deaths to eventually beat it without saving. Had one of the best tracks of music, too. Last edited by smurdleman; 03-08-2019 at 03:00 PM. If anyone has the score to this N64 game, I'd be grateful. This ones a grail to get for me, both for the fun music Lee Jackson composed (and he really does the best Duke Nukem music) and for the scarcity, the seemingly impossible search for it. Last edited by smurdleman; 03-07-2019 at 10:55 PM. Thanks Vector Harbor! Great to hear it again. Rep added. I can play the .usf files through foobar2000. It's the Mac version so it can't convert the files to anything, so I guess I gotta ask... could someone do me the favor of converting it to wav/flac? or point me towards a Mac program that could? Last edited by smurdleman; 03-12-2019 at 09:38 PM. could someone do me the favor of converting it to wav/flac? or point me towards a Mac program that could?